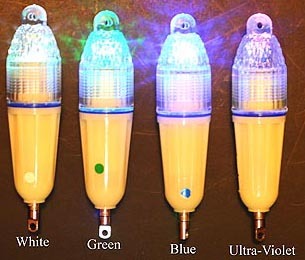 Underwater Water Fishing Lights for Sports Fishermen. Online store featuring the latest technology...waterproof underwater fishing lights. Waterproof underwater fishing lights attract fish to your lures & baits fast, prompting hundreds of varieties of sport fish throughout the world to go into a feeding frenzy. Our line of underwater fishing lights work in salt & fresh water, to depths of 2,000 feet, depending on the model. We also offer the world's first UV light, that attracts fish from a greater distance. Fish see Ultra Violet light, humans do not. UV light penetrates beyond 500 feet deep and also can be seen horizontally on the ocean floor from a great distance because UV light has a long wavelength compared to the standard wavelength of light. Our fishing lights will attract halibut, lingcod, salmon, trout, tuna, dorado, grouper and hundreds of other species of fish throughout the world. These underwater lights will also attract shrimp & crab! Our lights also work great for swordfish and other species of fish throughout the world. If you fish for swordfish or other deep water fish, these fish are a must! "Discover The Power of Using Battery-Powered Underwater Fishing Lights That Attract Fish & Shrimp"
Mix & Match Twin Pack. NEW !!! This AA battery underwater fishing light is the brightest underwater fishing light ever made. It has several LED bulbs that s bright white light in every direction. Depth rating: 1,500+ feet. Good for shrimp & crab pots, halibut, bottomfish and swordfish lights. The underwater fishing light revolution is here! Anglers from around the world have discovered the power of light and how it attracts fish of all species, shrimp and crab to your baits & lures. Join the thousands of anglers who have already discovered the power of using underwater fishing lights to attract more fish to their lines. We welcome your e-mails and photos about using underwater fishing lights. E-mail: jbeath @ Halibut.net Note: e-mail has spaces to avoid spam.